Electronic goods are bound to malfunction at one time or the other. And computers are no different. What bothers more is the fact that the computers stop functioning at the oddest times, especially when you are in the middle of a game or watching the most interesting part of the movie. Right from the printers, servers, workstations or any of the peripherals that give trouble, VRS Computers assures you in providing all kinds of IT Repairs in Dubai for all IT related problems. We have skilled set of in-house technicians who work round the clock to offer you the right kind of repair services identifying the root cause of the malfunction. VRS Computers is the market leader where the IT repair services are concerned. • You can expect an exceptionally prompt service from our technicians who are on their toes to provide you the best service available at a most competitive price. • We see to it that however intense the problem might be, the repair is done within the least possible turnaround time. Team of professionals to the core; we provide the repair services right at your doorstep. Any computer hardware or component that malfunctions is frustrating. There are a lot of things that go into computer repair services and if the computers that used to be once up and running are now non-productive; is a sorry state of affair. Laptop Repair: Laptops are as common as televisions of late. When you have a laptop there is a constant need of upgrading/updating, let alone when you have a technical issue with it. We, at VRS Computers see to it that is fast, reliable and accurate problem fixing is done. Right from diagnosing the right issue the laptop to virus/spyware removal, registry repair and defragmentation of hard disk, we provide all kinds of laptop repair services. Desktop Repair: Desktops continue to offer the best performance till date over any of its counterparts, like laptops, notebooks or tablets. One thing that gives an edge to the desktops is the fact that despite the advancement of technology, the desktops can be continuously upgraded. Moreover, the spare parts are also quite easily available for any sort of fixes. We, VRS Computers deal with any kind of up gradations, repair, quality checks, virus/spyware removal, hard drive repair/replacement and system tune up, which are only to name a few among the ample lot of desktop repair services we offer. iPad Repair: Personal to business use, iPads have become indispensible of sorts. The portability and the ease of use are the factors that have got it a lot of fan base across the world. VRS Computers offers one of the most efficient iPad repair services for all iPad models including the latest iPad Pro to all the available models in the market, the iPad Air, iPad Mini and the older iPad models as well. Printer Repair Dubai: Printers are one of the most important computer peripherals, which are useful to us on a day-to-day basis; malfunctioning of which can put you right on spot. At VRS Computers, we undertake all kinds of printer repair services including print speed repair, cartridge repair, spare parts replacement and graphics repair. We assure quality service for all brands of printers available in the market. A repair is something which needs an immediate attention; however as the prevention is better than cure, it is always better to have the systems well updated and amply maintained at regular intervals rather than to bring upon a complicated situation on ourselves. 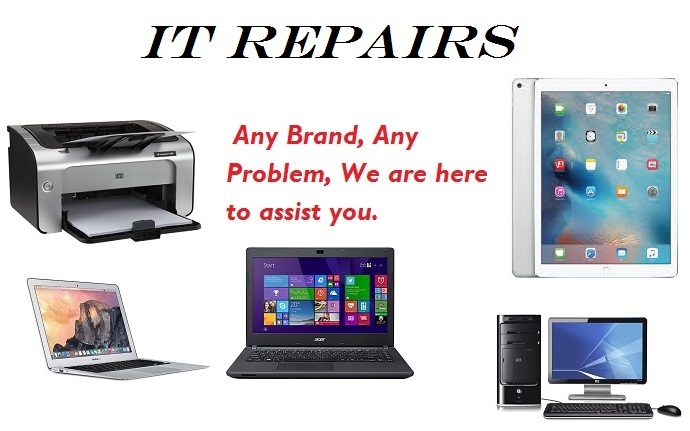 For any sort of IT repairs in Dubai, contact us today @ +971 4386 6001/12 or you may reach us at [email protected] for any kind of IT related issues.